Marian Goodman Gallery is pleased to announce a group exhibition curated by Marie Muracciole which will open on Tuesday, December 13th and will be on view through Saturday, January 21st. This exhibition began in Paris last summer. This second iteration assembles a renewed selection of works organized around the idea of departure. 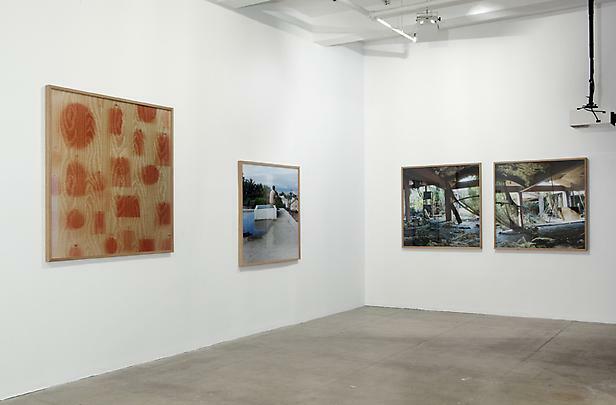 Here some works relate to the passage from one place to another, from one time to another. Some refer to changes in life, to the end of a story or a belief. Each one shows, in its own way, the energy and the loss generated by mutations of trajectories, by choices and separations. The title evokes a fugitive vision or, in a more analytical way, the distance covered or imagined, the metamorphosis and birth that inhabits some process of displacement. Fourteen artists, whose practices are distinct, from different generations and contexts, meet around a state of departure or bifurcation. Cartographies, transitory surveys, fictive constellations, representations of waiting or separation; these images tell not just one story. They do not resemble one another and do not complete each other. They are not trying to compose a formal or ideological cohesion. They witness or displace some situation in life that deals with separation, or alternatively use separation as process. In the time that has passed since some of these works were done they may have acquired new dimensions. Their common presence opens possible derivations, inviting us to engage in passage and try to figure out where we stand and what makes us present. Observation Point/Observation Point, made of two vintage post cards, hangs at Zoe Leonard’s eye level like a horizon of her own. Each shows a tourist’s point de vue within an American landscape, a double frame in the shape of a pavilion that, absurdly, has incised the view as to give it a “human” scale. This double opening on the landscape seems to imitate the symmetry of the body. The title refers to words written on the top of the architecture, locating the position of the artist, the perspective from the numerous thresholds that culture provides to inside and the outside worlds. 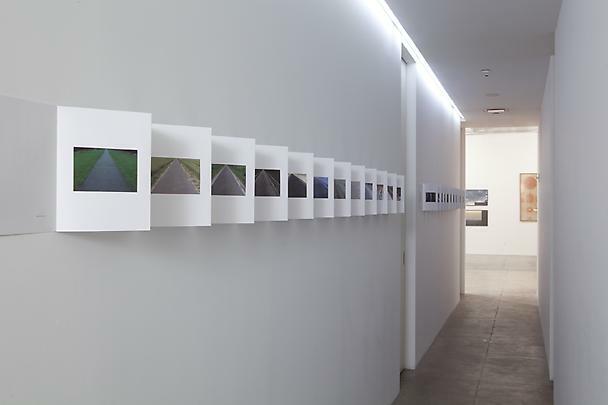 Claude Closky’s Inside a Triangle is a series of photographs of landscapes taken all over the world. Each image inscribes itself in a similar frame, with a cultural viewpoint, leading the very different contexts in a common direction: the vanishing point at the top of a vertical triangle where the eye stops. 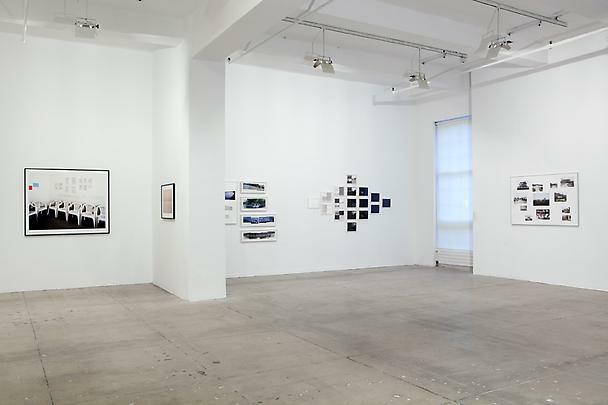 For this show, Closky presents the photographs in a book, a Leporello whose pages are literally unfolded on the wall, leading the viewer to perambulate the space with them. 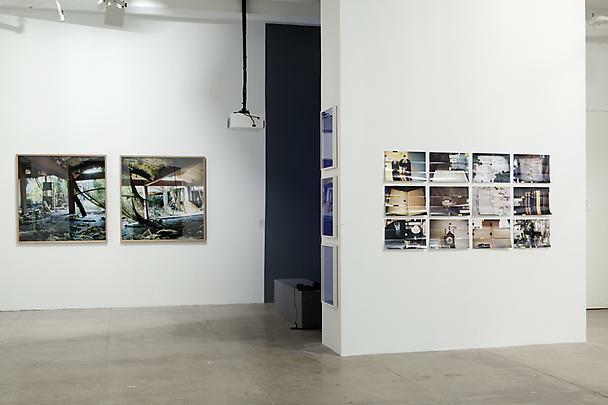 Moyra Davey uses the notion of accident in her practice of photography, particularly in her series of works entitled “Mailers”, images that she sent by mail to a related place that bear traces the voyage they made. “The End”, made of twelve “Mailers”, gives departure a definitive and radical definition. The photographs refer to the poet John Keats, and to the places linked to his presence in Rome where he died in 1821 at the age of 25. Images are of the Keats House on Piazza di Spagna, where books and letters of the poet's friend Percy Shelley are kept as well as those of Mary Wollstonecraft and her daughter Mary Shelley; the letters of Oscar Wilde; and of the protestant cemetery where Keats is buried as well as the Beat poet Gregory Corso. Christodoulos Panayiotou produced Sunrise (1 October 2010, 6.15) on the 50th birthday of the Cyprus Republic, documenting the view of the horizon in Limassol, his native city, at the exact time of daybreak. This photo is an exception within the corpus of photographic archival material that the artist has systematically worked with in the past in which he has excavated myths, cults, and narratives of his recently established country (founded 18 years before his own birth). It can be seen as a resume of previous works dealing with the mythology of birth, the imagery of tourism. There is no cultural identity without an “invention”, some deliberate montage and some hidden or nameless imaginary construction. Three photographs by David Goldblatt, “While in Traffic” or “The Waiting room…” transport us to the banality of everyday life: cars stopped in traffic, a waiting room in a credit company. 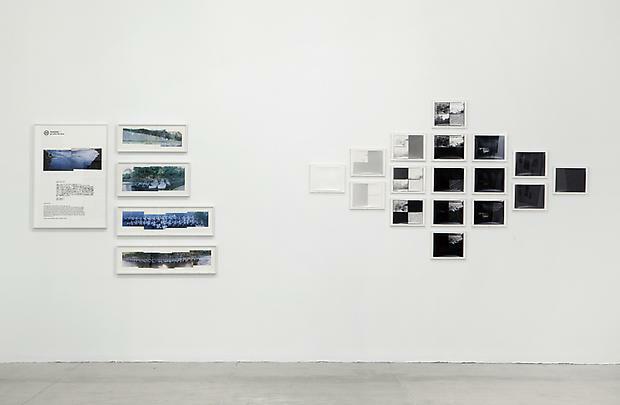 These are daily frames that shape together self-government and isolation. They are shift spaces, in which some states of mind or situations in life are temporarily held. Là-bas (Down There, 1.18h, 2006) is first of all a film. Chantal Akerman was commissioned to make a documentary about Israel and conceived of it as a cinematographic writing about exile made mostly from the window of her apartment. The film includes sketches from a larger urban landscape that you can’t really locate: the so-called promised land, and a too distant a horizon. The film stills here include one image of the window screen through which she looks outside; the first image of the sea in the film; and the first image of the sky. Part of a journey into, and a meditation on, Israel, as well as her own family history, these images are traces of intimate separation. Dan Graham was traveling by train when he decided to make a work about the suburban American landscape. First conceived as a slide work, then published in a magazine with a text, Homes for America, his first step as an artist and now a historical series, articulates many different notions and narratives: first in its relationship to Minimalism and serialization, as well as architecture as a model of society, collective and individual conception of space, travel as an initiation process, and American photography as construction of U.S. image. Homes for America now also records a way of life and its recent collapses. The two works shown here are a continuation of this classic Graham work. Yto Barrada’s photographs associate signs of abandonment and waiting with those of desire, or the metamorphosis of time: dreams of impossible departures, erased images from the past, hybrid states of modern ruins reclaimed by a strong vegetation. Like most of the images of this artist, the works take Tangier not as simple backdrop, but as place where history is being enacted, a frame as well as a subject matter. After “Landscape Manual” by Jeff Wall features a residential suburb seen through a car window. Black and white, the photograph taken in the late 60s was part of a book the artist realized before turning to the practice he has since pursued with the same medium. 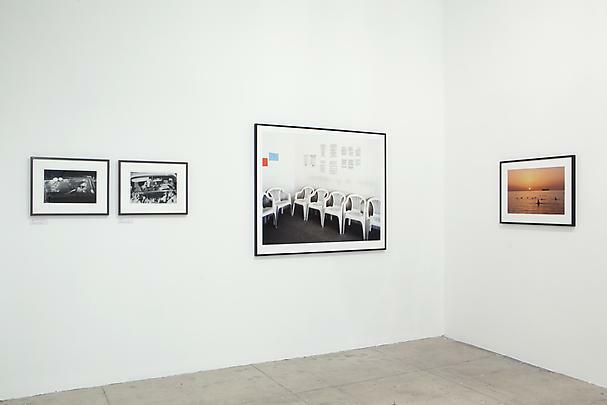 Showing it in 2010 relates strongly to this move from conceptual practice to photography, that gave him a means to build a critical exploration of representations. 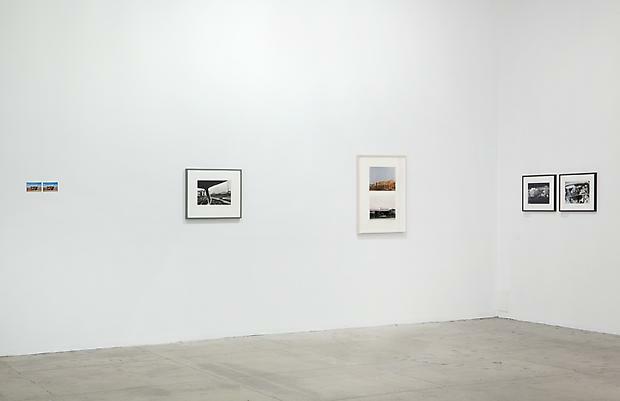 This image, like more recent of Wall’s photographs, depicts the world as it is, but from a specific and familiar frame. It relates to everyday experience and to the displacements we produce in it, as well as to the artist’s recent investigations into the near-documentary. Go with the flow is a fragment of a personal mythology; Christoph Keller tells how he put his trust in the North-South bifurcation of a Japanese river and sought to frame the orientation of his research between science and art. In this emblematic fiction, decisions are made by “the flow” of the river and by “nature”. In Keller’s work the relation between two forms of experimentation, scientific and artistic, remains as a trace of this first bifurcation. 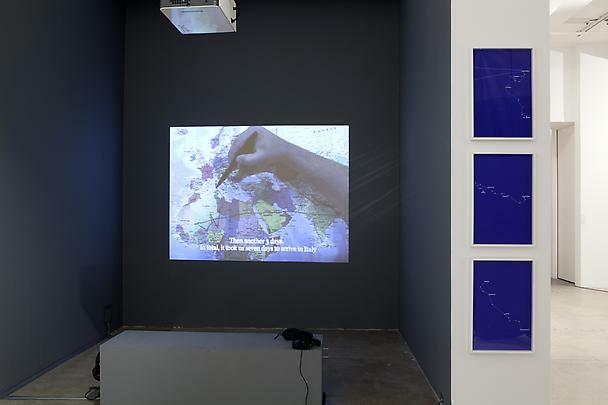 Gerard Byrne’s A Fibonacci progression (2011) is a recent work in the series Case Study: Loch Ness (2001…). 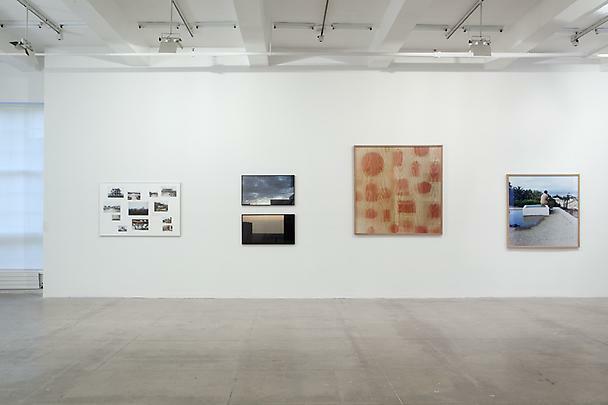 This series reconstructs a famous historical fiction, referencing art movements like Land Art and Arte Povera, and using different forms of media: film, photos, sculptures and objects. The “monster”, Nessie, becomes a means to question mechanical representation as a proof. The meaning given by image to some objects are here to query the little clue that mechanical representations can give upon any apparition. Therefore it reminds us the fragility of appearances toward what we wish to see. The main character for Prey by Steve McQueen is a machine, an old tape recorder that broadcasts some enigmatic sound, both continuous and jerky. The object lying on the grass suddenly rises, attached to a balloon, tearing out from earthly gravity in a tenuous and insistent tap dance. More abstract and unpredictable than can be expected from a moving image, the narrative stays on the edge of a plot without delivering its enigmatic destination. The spectator stays tuned to the ascension of technology into immaterial space, the eyes lost to the whiteness and expanse of sky. Pierre Huyghe’s Chantier Permanent is a seminal work, a prototype of the artist’s work. 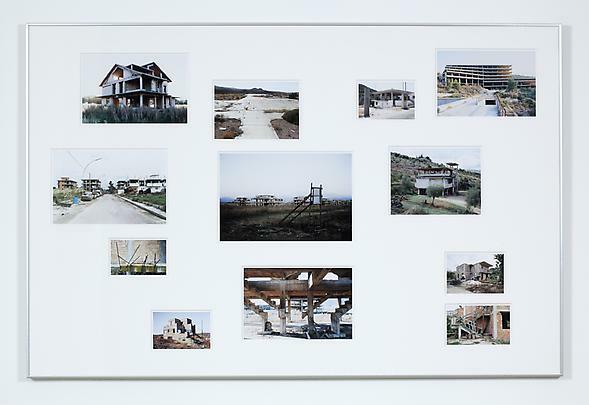 Made in the Mediterranean area in 1993, these photographs of unfinished houses, with their skeleton and process of construction revealed, had never been exhibited until now. The houses wait like ghosts of a project, or like representations by default of our daily spaces. Each of them suggest now the idea of a site, a physical frame for a situation not unlike the varied spaces Huyghe has built to investigate fiction. They are a point of departure to construct open narratives, against the grain of our daily alienations. Please join us at the opening reception on Tuesday, December 13th, from 6-8 pm.